Living on Cloud Nine: BOO BAGS!! Happy Monday! I'm feeling Crafty!! Back when the kids were little, I was always one of the room moms! It was such fun and the kids always look forward to what we put together for their parties! Fall was always such a fun time at school. I miss those days sometimes, but the creativity never ends in my mind. 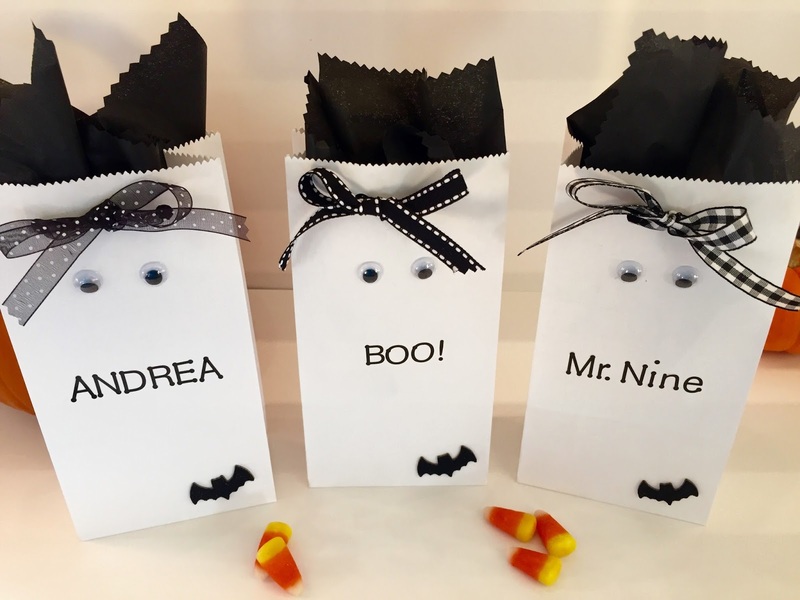 This was one of my favorites I thought up; simple to make personalized candy filled "Boo Bags", Yep, I put names on all 32 of them! 32 bags only cost 30 cents each!! These can be made for anybody and are sooo Easy!! I still make these sometimes for Family and Friends, like these I whipped up on Saturday. While I prefer to decorate in Harvest Theme, I do like to get into the Halloween spirit with goodies like these. You can add other sayings besides names or leave blank. 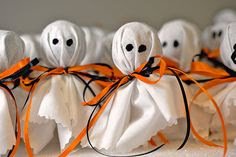 I fill them with candy, cookies, snacks or other tiny treasures like pumpkin scented votive candles. I found the glue and Bat stickers in the Dollar din at Target on Friday. Everything else is from Michael's or Hobby Lobby. Thin Black Assorted Ribbon 3/8"
Place two hole punches at the top of the bag, front face only, about a 1/2 inch down and an inch apart. While Bag is still flat, glue on the eyes about an inch down from the ribbon holes. Then, adhere a sticker in the bottom corner or anywhere you choose. Place a name, BOO! or saying with stickers in the middle. Open bag and thread ribbon, tying a bow in front. Fill with items. Cuts some squares (about 4' x 4") of black tissue paper with pinking shears and stick two squares in top of each bag. 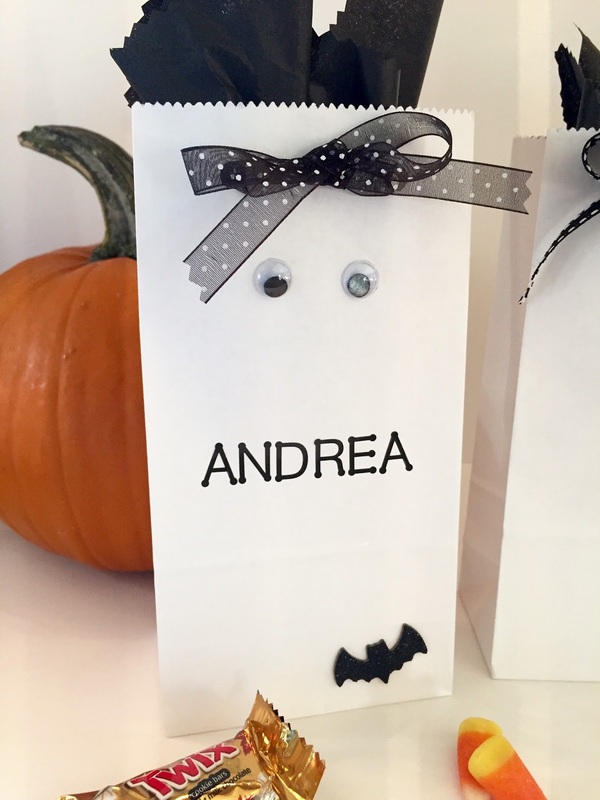 WooHoo, cute little "Boo" Treat Bags!!! Here are some other things I made for the class/Fall parties over the years!! This was a huge hit!! Use Kleenex, or my fave, plain white cotton fabric you can get cheap by the yard. Cut into squares with pinking shears. Cover Tootsie Blow Pops (forget those lil got tinier over the years Dum Dum suckers), You want a plump little ghosts. lol). Tie with thin colored ribbon and draw the eyes with a sharpie, you can draw a big oval scary mouth too. To display and transport, push them down in a block of Styrofoam. Heat oven to 375 degrees. Take a can of Pillsbury crescent dough sheets and cut into 10 stripes. Wrap 10 hot dogs in the dough leaving a little opening for the face. Place them on an ungreased large cookie sheet and lightly spray the mummy dogs with cooking spray. Bake for 13-17 minutes until golden brown and use mustard to put dots for eyes on your mummies. I hope you go make Monday Marvelous!! "It's no use....I'm just a scary ol' ghost!" You know it girl!! ;-) Happy Monday gorgeous!! These are the cutest bags! Am I too old to make one for myself? Lol LOVE all the fall DIY's! You are NEVER too old. Did you see the one with Andrea on it, that's me!! Made one for myself!! Ha!! Have a super day beauty!! For some reason while crafting, I kept singing "She's Crafty" by the Beastie Boys! Lol! I LOVE those little personalized bags!!! So cute!! Those bags are SO cute! And I love those little hot dog mummies. :) Too fun! Those bags are adorable. I wish I was going to a Halloween party to make some. haha. Ha ha! You're so cute!!! I hope you have a great day!! That giant pumpkin is adorable! How fun would that be for a halloween party! I can see Darcy bringing that to the Par-Tay!!! ;-) hope you have a great day!!! Andrea you have saved me!! 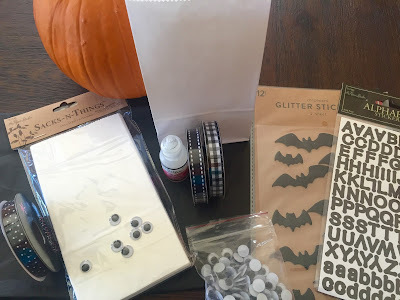 I am just getting into the groove of doing cute things with my son's preschool class and am in charge of his birthday party at the end of October with his class. I needed a few good ideas! Aww Inspo!! Love that I can help!! Sometimes I would feel pressure and be like "what in the world am I going to make for the class party?" Can't wait to see what you come up with!! ;-) I have lots more ideas, so if you need any just let me know! 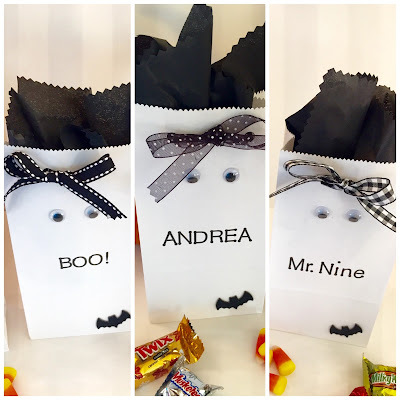 These boo bags are so cute! You are so crafty, Andrea!! My mom was always the room mom too so this brings back so many fun memories! Happy Monday! Aww, how sweet, I bet you were always so proud to have her come in with goodies! ;-) I hope you have a magnificent Monday! I am in love with all these goodies! Thank for sharing. I'll be getting on my Boo Bags soon. You go girl!! ;-) they'll look cute as a button, just like you!! The boo bags are a very cute idea and don't look to hard for someone that isn't crafty! I will keep those in mind for future Halloweens. Yep super easy peasy!! Hope you're having a great Monday so far!! oh my gosh those are adorable! 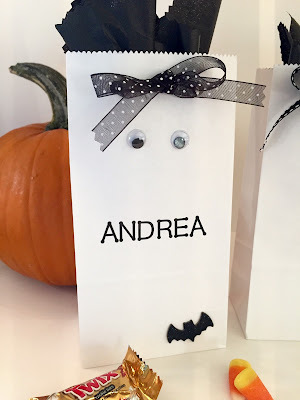 Those boo bags are so cute!!! 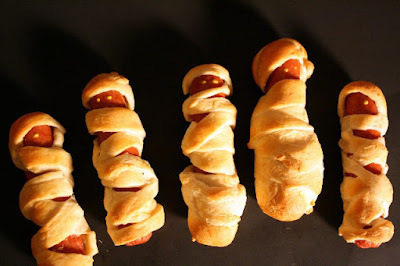 That would be fun to give to coworkers or friends when you see them in October :) I have made those pigs in blanket mummies quite a few times! Oh cool! Yes I have given them out at work before. In fact I brought in two today for my friends grandsons. ;-) Hope you're having a great day so far!! Ha ha! Yep as you can see from the pictures, I made one with my own name in it. lol! Hope you're having a great day so far!! Those bags are so cute!!! 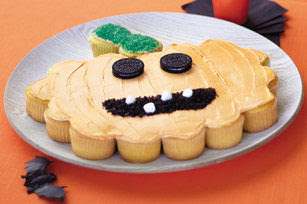 I need to host a halloween party now and give those as little treats/favors! Lisa I'm coming to your party!!! Bet it will be creative and fun!!! Hope you're having a great Monday so far!! 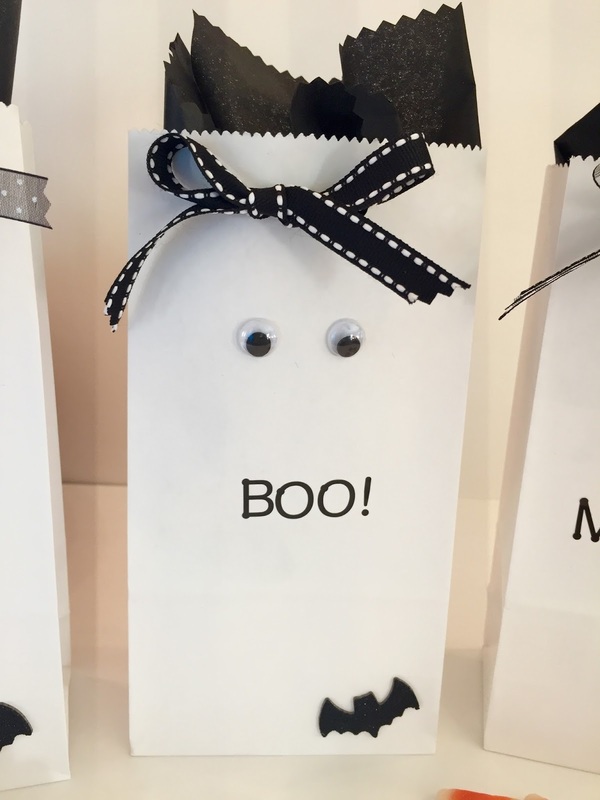 Those boo bags are so freaking cute! Thank you Pamela! I hope your Monday is going great so far! How cute! I love this idea! I'm so stealing it - what a great project for me and my son! Thanks for sharing, beautiful! Yes it's the perfect project for you and your little man and he can take them to preschool! I hope you're having a lovely Monday so far beautiful lady! Thank you beautiful! Hope your week is off to a great start!!! These are the cutest! It's so fun that you were a room mom! My mom would come help in my classroom too and I loved it! The ham chowder looks amazing as well! I am going to make it this week! Hope your day is going great! Darling ideas! One year we made a ghost out of cupcakes. Please stop on by and share it at our Wake Up Wednesday link party! WOW - you have some clever ideas, and a lot of energy!! I am sure your children will remember all the work you put into these for their classmates! These are too cute!!! Thanks for sharing at the #HomeMattersParty - hope to see back again next week! Great idea!!! Thanks so much for sharing them at the Bowdabra Saturday Crafty Showcase!!! I love black and white for Halloween. Your treat bags are adorable. The bows are the perfect finishing touch. Pinning. 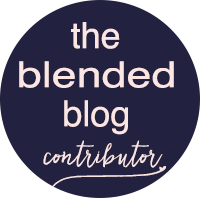 Thanks for linking up at the Halloween Blog Hop and Giveaway. Love these! I've also made the ghost pops and mummy dogs. They were both a big hit! Your "BOO" bags are simply adorable! Thank you for the inspiration. I hope you will share your craft at #thecraftycorner link party this week!